ADDIS ABABA, Ethiopia — Ethiopian investigators said Thursday that the pilots of a doomed Ethiopian Airlines flight repeatedly followed procedures recommended by Boeing but were still unable to recover before the plane dived into the ground last month. The crash of Ethiopian Airlines Flight 302 on March 10 followed the unrecoverable nose-dive almost five months earlier of another jet of the same model, a Boeing 737 Max 8, in Indonesia. Indonesian investigators have implicated a malfunctioning automated anti-stall program in that disaster, in which the plane’s computer system appeared to override pilot directions based on faulty data. 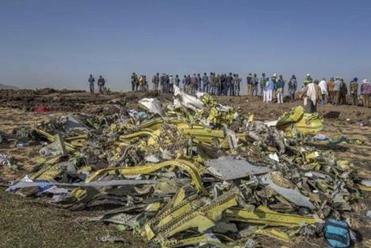 The investigators’ initial findings Thursday, based on analysis from 18 Ethiopian and international investigators and information from the jet’s flight data recorder and cockpit voice recorder, were released several hours after a news conference held by Ethiopia’s minister of transportation. The report said that pilot-side sensor readings connected to the computer system varied wildly and affected everything from their understanding of the plane’s pitch to its airspeed. Samya Rose Stumo, 24, who grew up on a farm in Sheffield, a small town in the Berkshires, was among the 157 passengers and crew killed in an Ethiopian Airlines plane crash last month. The initial findings are likely to heighten scrutiny of the Max, Boeing’s newest and top-selling generation of jets. Since the Ethiopian Airlines crash, airlines worldwide have grounded their Max fleets amid concerns over the apparent propensity of the stall-prevention system, known as MCAS, to malfunction when fed erroneous data. Moges recommended that the plane’s flight control system be reviewed by the manufacturer. And she suggested that the aviation authority ensure that a review of the aircraft flight control system be adequately addressed by the manufacturer before the aircraft was released for operations. During the news conference, Moges did not specify who the manufacturer was or to which aviation authority she was referring. Nor did she or the report mention MCAS by name. After the conference, however, Moges told The New York Times that MCAS had been active during the flight’s brief journey. “The pilots have turned the MCAS on and off, but I can’t say how many times because we will find that out when we have the final report,” she said. The crash of Ethiopian Airlines Flight 302, which killed all 157 people on board, came less than five months after Lion Air Flight 610 went into the sea off the island of Java, killing all 189 passengers and crew members. “To ensure unintended MCAS activation will not occur again, Boeing has developed and is planning to release a software update to MCAS and an associated comprehensive pilot training and supplementary education program for the 737 Max,” Boeing said in a statement after the report from Ethiopia was released. MCAS, which was introduced in all Boeing 737 Max jets, pushes a plane’s nose downward if data indicates that the aircraft could stall because it is angled upward too steeply. In creating the Max jet, Boeing added bigger engines to the 737, which gave the airplane the fuel efficiency it needed to compete its rival, Airbus. But the change also altered the jet’s aerodynamics, and the larger engines had a tendency to push the airplane’s nose up. To compensate, Boeing engineers created MCAS, which was meant to make the Max behave more like older versions of the 737. To become certified to fly the Max, pilots with prior 737 experience had to do only a couple of hours of online training.